Today, Thursday November 17, 2016 witnessed yet another legal combat between Mazi Nnamdi Kanu, the leader of Indigenous People of Biafra, and the Federal government of Nigeria. 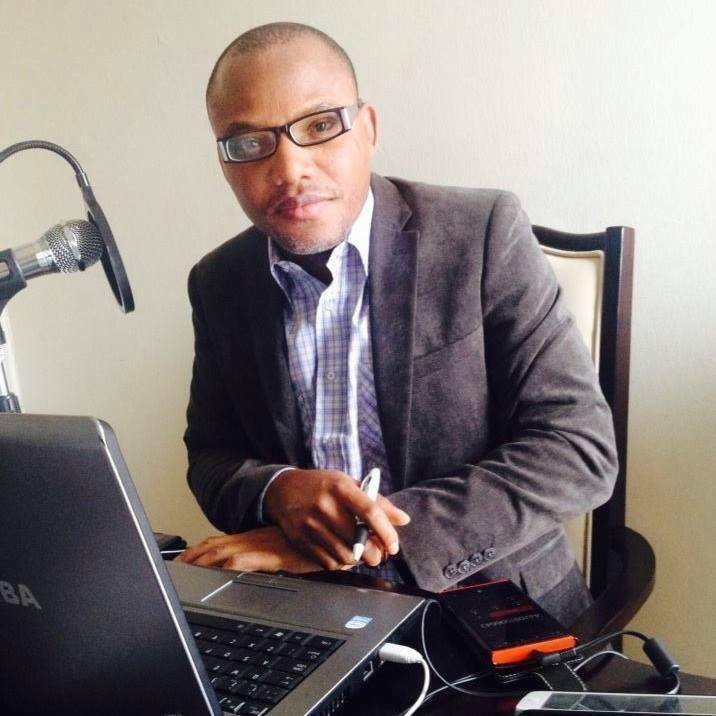 Nnamdi Kanu whose application for bail hearing was entertained by a Federal High Court sitting in Abuja today, has been illegally detained by the Nigerian government since October 14, 2015. The IPOB leader and three other defendants- (Benjamin Madubugwu, David Nwawusi and Chidiebere Onwudiwe) who are standing trial for alleged treasonable felony by the Nigerian government had on November 8, 2016, submitted an application for bail through their legal representatives. At about 11:00am this morning, the four Biafran activists are already in court, as their arrival stirred jubilations among hundreds of Biafrans who have stormed the court premises in solidarity with Nnamdi Kanu. The proceedings which started smoothly inside the court room, was however marred by Nigerian security agencies whose excessive use of force both inside and outside the court led to the arrest of some IPOB journalists and activists, and their equipments confisticated. The different Counsels representing Nnamdi Kanu and co-defendants, all introduced themselves to the honourable court, likewise the counsel representing the Nigerian. Afterwards, Barrister Ifeanyi Ejiofor, Counsel to the first defendant (Nnamdi Kanu), told the court that the predicament of his client is state sponsored, and an affront to United Nations declaration on the right of indigenous people to self determination. "My lord, the bail application for the first defendant (Nnamdi Kanu) was filed to this court in accordance with the rule of law," Hon Barr. Ifeanyi Ejiofor, who is representing Nnamdi Kanu told the honourable court. "On the 17th of December, Justice Ademola Adeniyi ordered that the first defendant be released unconditionally, but that order was not obeyed," he continued. "My lord, the international body has gained massive interest on this matter. "My lord, the President of Nigeria stated clearly that Palestinians have the right to self determination. He also stated that nobody has the right to refuse anyone self determination," Hon Ejiofor tutored the presiding Judge, Binta Nyako. However Ejiofor's speech was cut short by the judge, who posited that he is consuming much time. Hon. Essien representing the second defendant substitued Barrister Ifeanyi Ejiofor whose time has expired: Hon Essien noted that the charges levelled against his client lacks merit, as IPOB is not an illegal organization. He however admonished the court to strike off the charges. "My lord, on the 10th day of November, we filed for his bail application. On the 16th day of November, an affidavit was posted by Miss Grace. "My lord, we filed same address on 15th of November. We also refer the honourable court to exhibit ddf2 attached to the prosecution counter affidavit. I am asking the court to rule out the count charges," Hon. Essien stated. "My lord, I am stating out this for the purpose of emphasis- My lord, the charges against the 3rd defendant of belonging to an unlawful society is out of context. "IPOB is legal and known round the world, hence I demand this honourable court to strike out the charges against the third defendant," he said, and retired. My lord, we filed an application of bail. And this application, is supported by 34, 36 of 1999 constitution of Nigeria as amended. "My lord, we adopt the argument in the written address. In response to the complainant counter affidavit, we have filed 6 paragraphed Further and Delta affidavit, which was filed by Miss Oyiyechi who is a legal practitioner. "My lord, the 4th defendant is not included and has no knowledge of what we are doing. How can the prosecutor add the 4th defendant into the Case of the three other defendants?" Hon Okpara asked. "My lord,my Father said, if you want to know how, your wife will be when she gets old, watch your mother in-law," he continued to the amusement of the people in court, as the judge demanded for explanation. "My lord, the charges is the daughter. While the prosecutors is the mother. "My lord, the prosecutor have no case, hence I demand the charges should be striked out." "My lord,in response for application for bail, attached to it is exhibit dppf1 and its urging this honourable court to refuse the application and also, to refuse further hearing. "My lord, as suggested by your Lordship in interest of justice, we can go ahead and ask for the argument of the 3rd defendant" he said. "My lord,there is nothing before us against my client. The supreme court, stated that as long as,there is no evidence against a defendant, he should be granted bail." After a tensed up legal battle between the counsels to the defendants, and that of the Nigerian government, the honourable court adjourned its ruling on the bail application to December 1, 2016. Meanwhile, during the course of the Proceedings, the security agencies inside the court were busy confisticating the equipment of some Biafran journalists who were relating the event live to millions of Biafrans and friends of Biafrans all over the world. Most of the journalists are currently missing as they were reportedly whisked away by the security agencies. Family Writers reporters, Ibeh Gift Amarachi, Prince Ugochukwutubelu Olisakwe, Moses Agbo and Ngozi Kalu, all narrowly escaped arrest, although the security agencies confisticated their gadgets. A Biafra Writers reporter, Ejike Ofoegbu also faced a stiff opposition from the officials who also seized his equipment. Many IPOB reporters were not even allowed into the court room, as they were forced outside the court premises by the security agents. Also hundreds of Biafrans who were outside the court premises were subjected to an unimaginable hostile environment, as scores of highly equipped security agents mounted at strategic positions, ready to pull the trigger. "We almost fought as Director and brothers came out of the court room. To snap them was war. I waited for them at the stair case, ready to snap as they walked towards the van, another security blocked me. "He was furious at me. He started speaking Hausa language, I responded. I spoke to him in Hausa to allow us snap, he said it was order from above. We argued and argued, yet no way. He told me he would lose his job if he didn't carry out the order. "I began to suspect them when they became friendly somehow at the gate. Quite unlike before! Not knowing their attack would be in the court room." She said. "The Prison warders who came in their bus, shouted 'Biafra must go' to the hearing of the DSS who came in two hilux buses with Director. "Shouts of 'Biafra must go' fill the whole premises, some High Court staff came out of their offices watching us as we surround our leader, ready to leave. Outside the court building, where Biafrans were, staff of other agencies around there came out watching as we chant our Biafran song. "This is the most interesting part. It erased all the pain today" she concluded. excellent to Indigenous people of Biafra God bless Prince Nnamdi kanu and Biafrans all over the world ise ise iseeeee.